Cinco de Mayo is the perfect excuse to throw a party, eat Mexican food and drink margarita’s. Here are some tips to help you plan your party. Evite has a variety of invites that you can choose from for Cinco de Mayo. Decorate with lots of wonderful colors, and include fun items like sombreros, Mexican blankets and pinatas. This Cinco de Mayo Table Topper would add great color to your table. You can make it easily with dry beans. Hostess Jo has fiesta items like this one on sale right now! 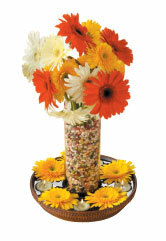 Entertain Exchange has a tutorial on how to make these easy and fun centerpieces. If you are having a large party, don’t foget to hire a Mariachi band to really get your guests in the mood. Pinatas are a Mexican tradition so this is always great to have for the kids or the adults. Martha Stewart has instructions on how to make your own pinata. Of course, for food their are so many great recipes to serve. Have a buffet and serve fajitas with beans, guacamole and queso to go with it. Don’t forget the margaritas!! Toast Mexican culture and celebrate Cinco de Mayo in style!! Thank you so much for linking to my shop!!! I love the flower arrangement, it is so cheerful and the beans are perfect for Cinco de Mayo.